Welcome to the Brain Damage gallery! Within this section, you will find various contributions from talented members of the Brain Damage community, who have a particular artistic flair. 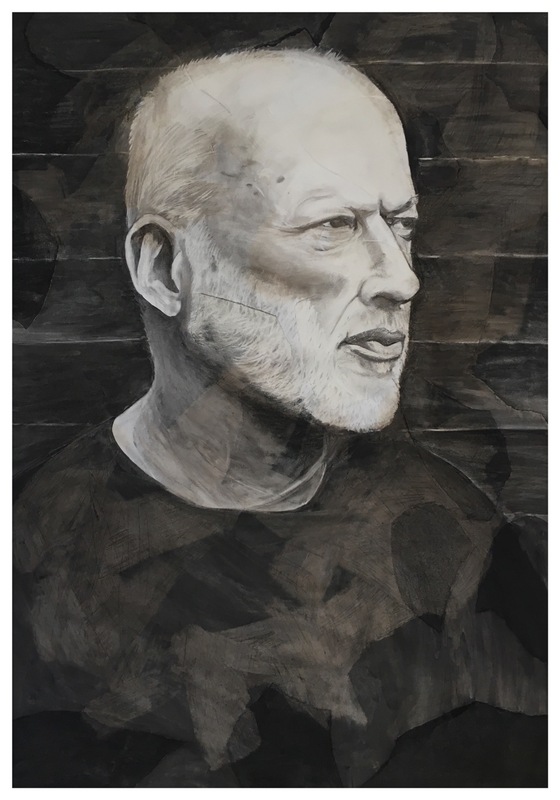 As with any art, not all of what you'll find in here might be to your taste, but all of it has been crafted with a lot of effort and dedication, and above all, a respect for Pink Floyd and its constituent past and present members. We welcome other contributions for possible inclusion here. Not all artwork can be used, for copyright and other reasons, and it might be that we need to reduce the size (physically, or by using a little careful image compression to reduce the overall file size without visually compromising the piece) of contributions should they be used. With thanks to BD regular and contributor Kevan Porter, here's the latest addition to our Floydian art gallery. 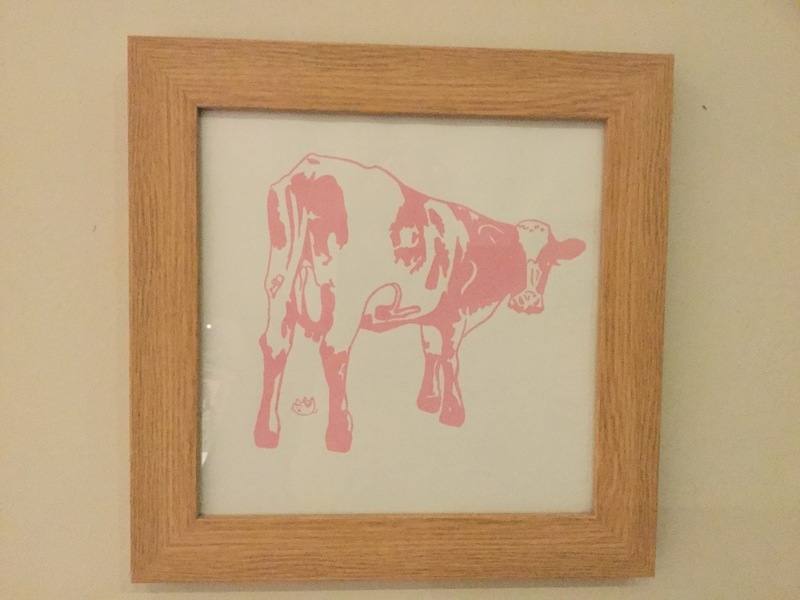 Kevan: "I created this piece as part of an art class at The Attenborough Centre in Leicester. After studying the work of Frank Auerbach, the brief was to create a large charcoal portrait of a person whose face we were familiar with. "It's the first time I've created a piece this size, the first portrait I've drawn and the first time I've worked with charcoal. My usual work is abstracts in acrylics. "The image size is 80 x 115cm, charcoal and gesso on collaged paper." The artwork is indeed a sizeable piece - the dimensions can be properly appreciated in his second picture, with the other items giving the sense of scale to things. I originally created this as a gift for my dad. 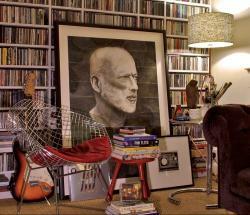 He'd not long before lent me a couple of books on the Floyd's album art, in which I found my inspiration. At the time I was exploring screen printing as an illustration medium, which I really enjoy. I was invited to an evening by the Brighton Illustrators' Group; it was an exhibition of George Hardie's work, and a talk given by the man himself. It was enlightening to hear from the man responsible for the Wish You Were Here album art, and how his iconic isometric style stemmed from taking an O-level in technical drawing. He told us that when bands (such as Led Zeppelin) approached Hipgnosis wanting album art, George hadn't the foggiest about their message, music and vision. He said he literally used to just ask them, "what do you want me to do? 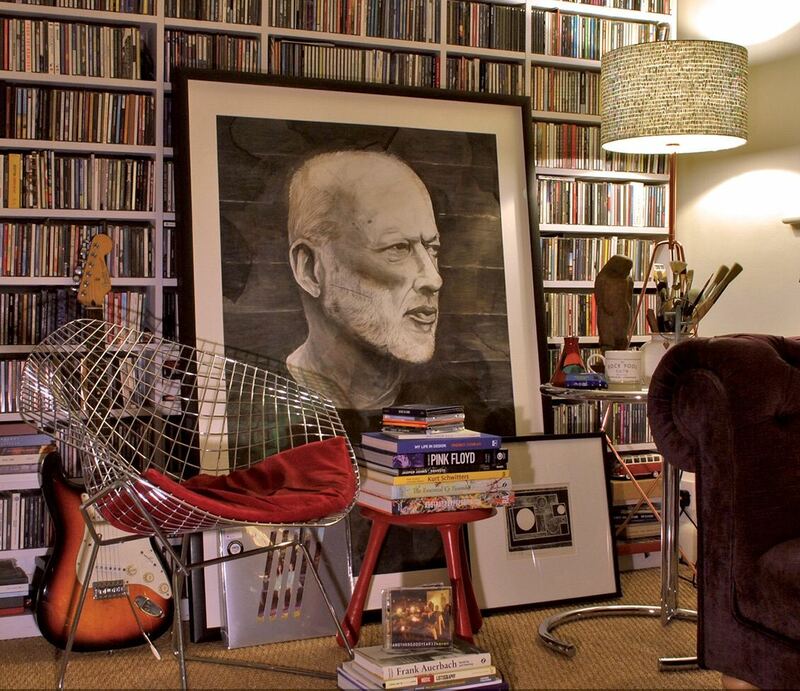 "� He also said that his inspiration stemmed from far and wide and he never sketched ideas down, rather he just keeps a note book full of words and things he always has gone back to throughout his career. Another interesting thing was that Mr Hardie seemed somewhat unamused at the proposal of him signing the Floyd books I'd brought along. "Who's this for then?" He asked. When I told him it was for my dad he replied, "yes, it usually is." One of Brain Damage's longer term contributors is artist Duff Moses, a commercial artist in Los Angeles who can be found through 310artists.com. 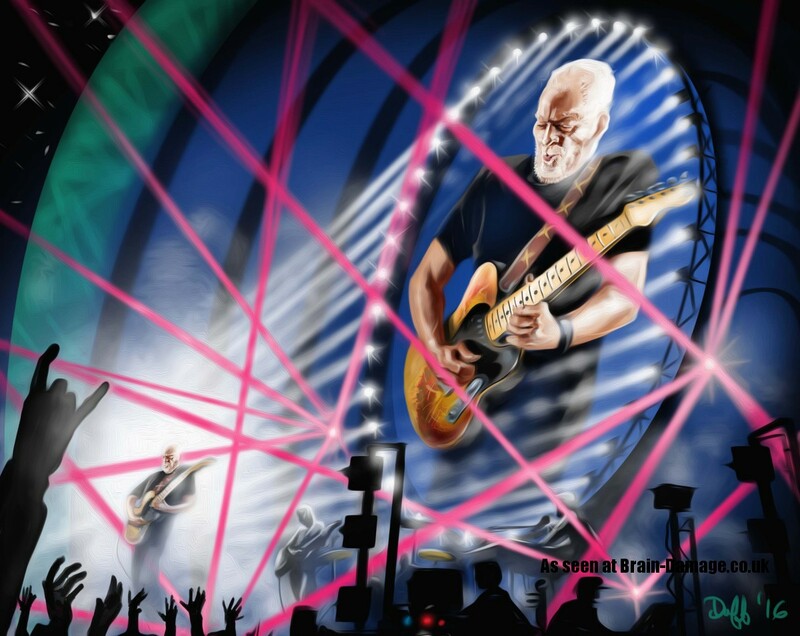 Over the years, he has very supplied a number of images inspired (and representing) his love of Pink Floyd and its constituent parts, as can be seen here, here and here. 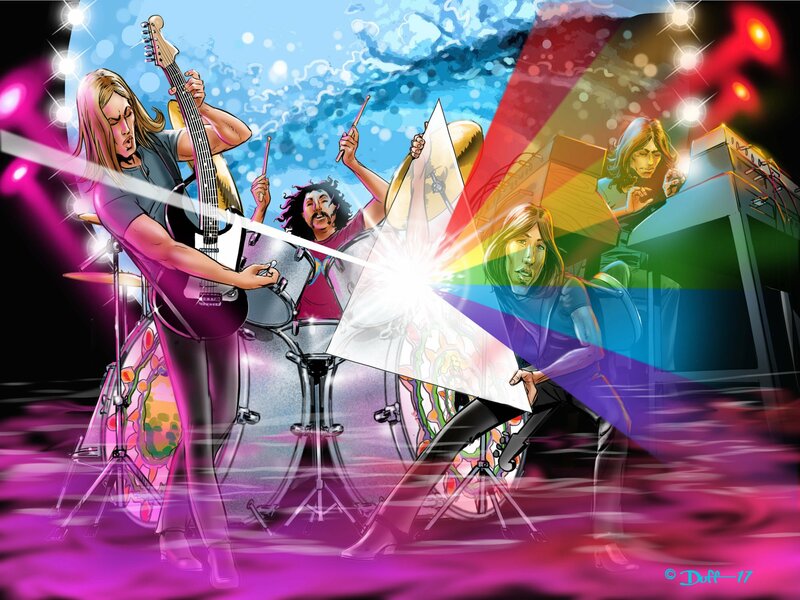 Today, we bring you Duff's take on what is often thought of as the "classic" four-piece Floyd line-up of the 70's, with some Crystal Voyager footage on Mr Screen, and Roger wrangling a prism-shaped item, with suitable results. A wonderful, vibrant look at the band in those days! We always welcome artwork from our visitors, so if you've been inspired enough by the band and their music to create something, please let us know. We always welcome artwork from our visitors, so if you've been inspired enough by the band and their music to create something, please let us know! With Wish You Were Here celebrating its 40th anniversary this year, here's a newly created artwork which is very impressive! The vinyl package of WYWH came with a typical holiday postcard, often used to express the sentiment in the album title. What would one use to send a postcard? A postage stamp, of course. 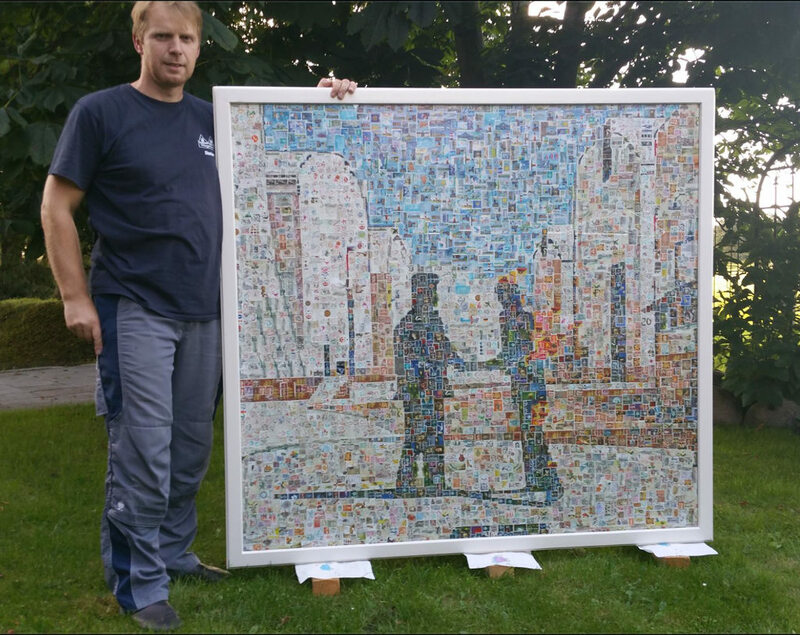 This has been taken to an extreme, and very impressive, conclusion, with Stefan Jürgens having recreated the album cover by using no less than 5000 postage stamps from various countries! 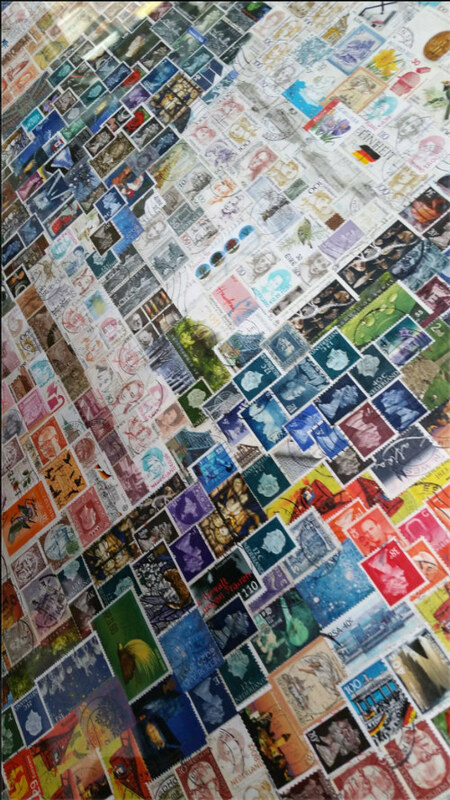 The piece measures 148 cm x 158 cm, and none of the stamps were glued at an unusual angle - the contours and shapes are created only by colours or images on the stamps. Stefan told us that it took him five months to complete this artwork, and that the stamps were a random selection that he collected from friends, family or bought at flea markets. He was inspired by the music and the work of Pink Floyd to create this tribute. The pictures here show Stefan with the finished article, and a close up showing how the stamps were arranged to create the imagery. 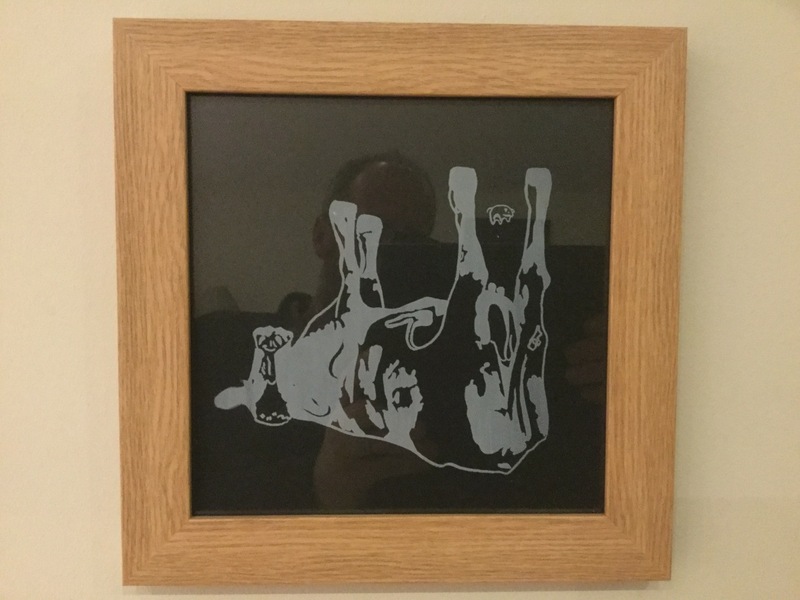 Our thanks to Stefan for getting in touch with this; we are always keen to see what people have created, so if you've made your own artwork or version of a Floyd album cover, for example, please get in touch!